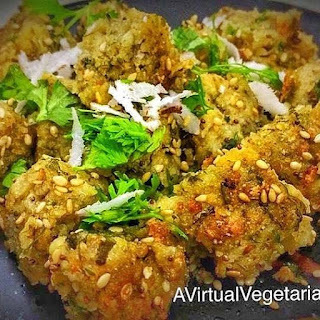 A Virtual Vegetarian blog is a collection of recipes and musings about food. · This recipe needs a steamer or an oiled sieve which can be kept on a vessel of boiling water to steam the muthias. · Mix grated doodhi, onion along with wheat flour, besan (Bengal gram flour) and semolina together. Semolina is added to give the snack a crunch and hold it together well. · Add in spices including turmeric powder, green chilli and ginger paste, cumin seeds, fennel seeds, asafoetida, sugar, salt, lemon juice and 1 tbsp of oil and mix the dough well. · Shape a lemon-size portion with your hand until it binds well. Alternatively, the muthia dough can be rolled into a cylinder of one-inch diameter, rolling it between a hard surface and the palm of the hand. Then cut it at ¼ inches intervals, to form slices or disks. 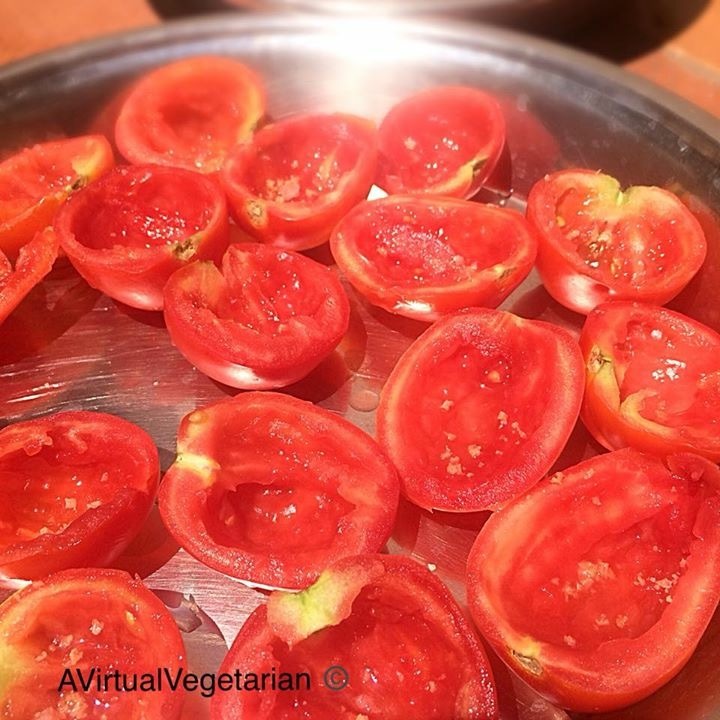 · Steam the cut muthias for about 15-20 minutes and allow them to cool completely. 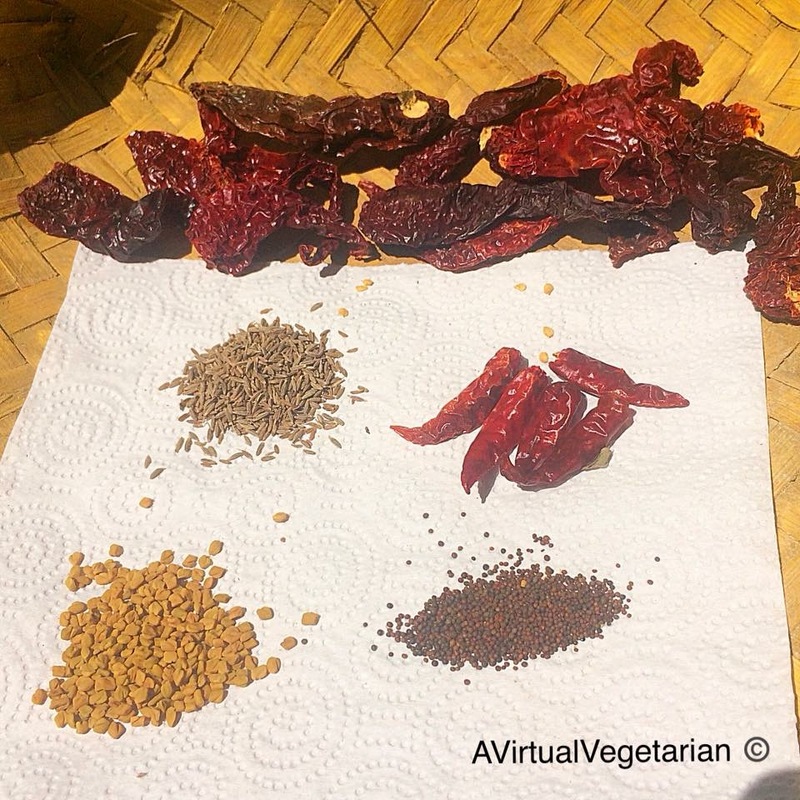 · To temper the muthias, heat 2 tsp oil, add mustard seeds and asafoetida, once the mustard seeds splutter, add the muthias carefully, tossing them lightly. · Cook until the edges are brown in colour, and serve warm with a sprinkling of grated coconut and chopped coriander leaves and chutney of your choice. The state of Maharashtra in India is blessed with wonderful landscape. From lush coastal areas to rugged mountains and tropical forests to expansive plains. With so much diversity and abundance , Maharashtrian cuisine is bursting with flavours and textures! A specially curated menu by expert Chef Parimal Sawant, will journey from Kolhapur to Malvan and everywhere in between to enjoy dishes made with well-known masalas from each region. Bringing together vibrant flavours and condiments like freshly pounded Thecha, Lasan Chutney, Shengdanya cha Chutney and Kolambi che lonche. Expect to see equal amounts of fantastic vegetarian and non-vegetarian fare as special dishes are chosen to showcase two very distinct style leaders of cuisine, the spicy Vidharbha styles which encompasses dishes like Kolhapuri Chicken and Bhakarwadi and from the Konkan coast the Malvani style fish curry and Kolambi Masala. In the starters there is a wide variety starting with delicious Sol Vadi from Sabudana Vada, Kothambir Vadi, Taleli Masali. In the mains there are dishes like Valacha Bhirde, Batatachi Bhajji, Varhadi Kombadi, Zunka Bhakar, Tandalachi Bhakri and Masala Bhaat. For desserts there are Taleli Modak, Naralachi Wadi and Basundi, what more can one ask for? Don’t miss an opportunity to indulge in some deliciously rustic Maharashtrian fare! Here is a plum opportunity to elevate your fine dining experience. The Uber talented and creative Chef Tejas Sovani of Amaranta, Oberoi Gurugram was in the city hosting a PopUp at Szechwan Court, Oberoi to showcase his interpretation of Modern Indian Cuisine. Trained in Michelin star kitchens, Chef Sovani marries both traditional flavours and adds the pizazz of modern techniques and exquisite plating. Each dish stood out as a shining example of Modern Indian cuisine done right. The PopUp will be run under Chef Nimisha Verghese until May 30th, 2018 and will be available for both Lunch and Dinner. The signature 4-course set menu offers both vegetarian as well as non-vegetarian options under each course. I will be reviewing the exquisite vegetarian options, my co-dinners chose other options and enjoyed it thoroughly. The meal began with an amuse-bouche of battered and deep fried spinach leaf encased Dhokla in a teekhi meethi khatti sauce. Compressed Melon Tartare. The melon had the texture of tuna and the mustard cream sauce reminds us of kashundi. Topped with ginger crisps, it brought all the flavours together. Paired with The Fishplate 2015, Sauvignon Blanc it was refreshing. A Spiced Potato Bao came injected with a mint chutney that added an extra zing to the potato stuffing. The topping of a creamy mint avocado Tartare pulled all the flavours together. This was paired with the Viognier Grover Zampa Vijay Amritraj Reserve, a full bodied Red. We were presented with a delicate palate cleanser; A Fermented Plum Sorbet with black salt which had tart flavours and a salty component reminiscent of a kala khatta gola. Birbal ki khichadi made with Cous-Cous, Quinoa, dal and served with choice of 4 toppings and a CornTikki. The toppings were creative and playful. A mellow Garlic Burrhani raita, Rice Chiwdas that were tart and spicy, Achari Gajar Gobhi and a wedge of lime. We are sure that a while this dish was inspired by North Indian cuisine, I could detect a hint of Bisibele somewhere. Pickled vegetables in a garlic flavoured Spinach puree was embellished with homemade cottage cheese crumble and the most delightful Curry leaf Snow. Studded in the bed of green was a luscious piece of King mushroom sauteed in butter and a few pickled vegetables. An intriguing play on textures and flavours that was outstanding! The crowning glory was a medley of flavours and textures on our dessert plate. 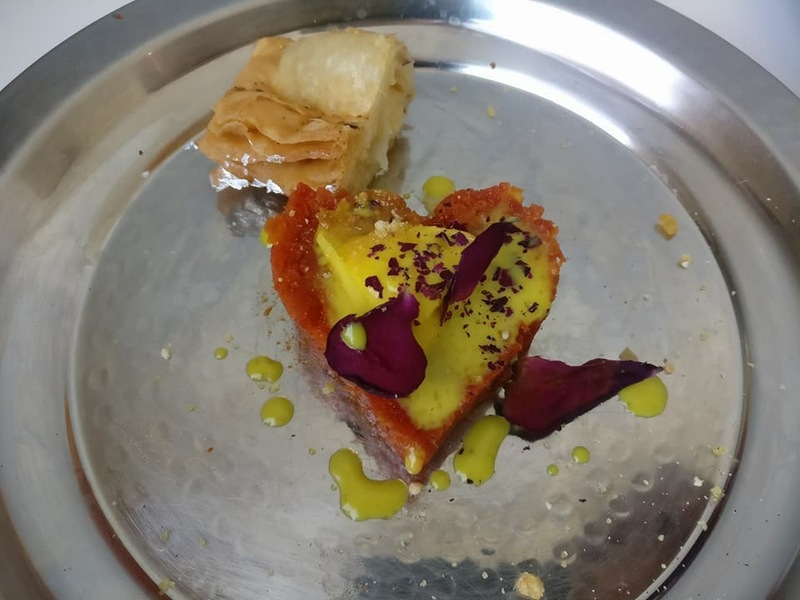 A Fig and Beetroot Halwa was stuffed in a Phyllo Sambusek and served with Aamras foam, Beetroot reduction and crusted with seasonal fruits. What a way to end a spectacular meal, the accompanying wines were perfect and the company of fellow diners even better. I stubbed my toe onto the dining table leg and the nail popped off but it was still barely hanging from the cuticle. Anyways I bandaged my toe and went about my chores. I dropped kids off to school and on my way back home I passed a thelewala (hand cart) selling ripe tomatoes. My driver knows me well enough and said, Madam, tomato chanagide, Photo tege (kannada language)? Don’t you just love it when people around you know what will cheer you up! 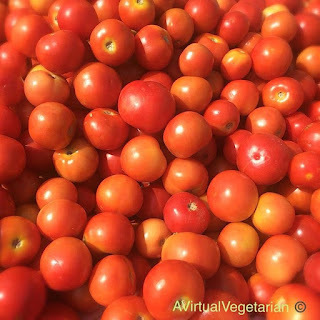 Anyway I bought 2 kg of these luscious desi/natti heirloom tomatoes which has a hint sourness and full of the sun ripened tomato flavour in them. I returned home and knew I’m low on my pickle/chutney stock so I decided to make a batch of Tomato thokku (cross between chutney and pickle), but I wanted to make it spicy Andhra style to eat with curd rice or Idli/Dosa. The unique method of preparation is that the tomatoes pulp/seeds are scooped out and the tomatoes halves are sprinkled with sea salt and sun dried for a whole day. Sun dry the tomato halves in the sun for 1-2 days depending on the intensity of the heat until the skins attain a crinkly texture. Blend to a coarse paste the tomatoes and tamarind. Roast the powder ingredients and set aside. Heat gingelly/sesame oil and add the mustard seeds and Guntur dry chillies. Allow it to darken then add the crushed garlic, curry leaves and asafoetida. Reduce the heat to low and add the powder and the tomato purée. Cook on low, stirring occasionally until the oil floats to the sides of the pan and it emits a beautiful aroma. About 6-8 minutes, add salt and turn off the flame. Cool and store in a glass jar in the fridge. This will keep for up to 3-4 weeks... but you will finish it before that! Buranchi is the Japanese word for Brunch and we recently had the opportunity to meet up with entrepreneur, cook book author and a raconteur of good tings in life, Rocky Mohan who I've known virtually for couple of years and am very fond of his Kashmiri Dum aloo recipe which is a staple in our household! His newest venture is the bible for gourmands, the Gourmet Passport app. While everything in life nowadays is driven by technology this Application is your one stop concierge service for all your dining needs. Carefully curated by Rocky and his team of experts ~ restaurants that offer truly exceptional dining options are part of this program. And that is how we landed at the cool and ultra hip new restaurant 1Q1 for their leisurely Sunday brunch of Pan Asian food with a special emphasis on Japanese cuisine. Chef Mako Ravindran and entrepreneur Anirudh Kheny have put together a phenomenal menu that has something for everyone. Since I am vegetarian I tried all the vegetarian and vegan delights. The dim sum were exquisite, super thin skinned dumplings were stuffed with a delicious assortment of vegetables and tofu and were served steaming hot with and assortment of dipping sauces. Next I tried the sushi, one of which was rolled with sweet crunchy pickled cucumber and was my favourite. Classic Japanese fried dish ~ Tempura a light as air battered deep fried vegetables were perfectly crunchy coating and the beautifully julienned vegetables maintained their crispness while frying. The restaurant also served a Robatayaki (Japanese slow cooking grilling technique) Tofu in a sweet and sour glaze that was quite nice. For the mains I ordered my all time favourite, Thai green curry with vegetables and steamed rice. The curry was perfectly spiced and had the beautiful creamy texture that one expects to eat with aromatic steamed Jasmine rice that was cooked just right, neither clumpy nor under done. I would have loved to have a few leaves of basil and Kaffir lime added to the gravy to give that authentic flavour and aroma, though. Finally the dessert spread was not too large but it hit all the right notes in term of sweetness. I tried simply delicious the Old Monk chocolate mousse an ode to the iconic Indian rum Old Monk which is was created by the family of Rocky Mohan of the Mohan-Meakin fame. The brunch was made even more delightful in the company of Bengaluru glitterati like the dapper Suresh Hinduja, elegant Chetan Kamani who made a very short appearance, charming Sheetal C, handsome Nitin Hajela, delightful Debolina and her husband, the lovely Namita, fascinating Swati, ravishing Deena, lovable Anita and her husband and so many more! This app is worth its weight in gold and if you need to find gourmet dining options in Delhi, Mumbai our own Uru, then download the app and start enjoying its benefits today, you wont be disappointed. A native to India, the root vegetable Taro is recognized to have originated in southern India. Oddly Nigeria is the top producer of this vegetable and India is not even in the top 5! Like any root vegetable it likes deep, moist, swampy type soil to grown in....very tropical indeed. There are over 25 varieties and the most common one in India are the small sized ones that range from 1.5-3 inches in length. I cook this vegetable quite often as the boys enjoy this vegetable lightly spiced and plenty roasted, but then there are days when I like to make it gravy style so that we can have it along with roti or rice. I often surprise guests with the recipe I'm sharing today and tends to draw much curiosity and a new found appreciation for the vegetable that often stumps people on how to cook it! Couple of important things to keep in mind is that the tuber has a mildly gooey texture on the outer surfac after cooking. Choose even sized taro or arbi, so that they cook evenly. Boil the arbi in water for 6-10 minutes depending upon the quantity. Peel the skin off and then cut in even sized pieces. Roasting the arbi gives it a crisp exterior and is perfect to use in the Air-fryer. Finally, some varieties can give you an mildly itchy/tingely senstations in your palms while peeling so just lighly grease your palms and add some sour agent like, amchur, lime juice or tamarind water while further cooking the tuber to neutralize the oxalates. Boil the arbi in water for 6-8 mintures or until they are soft enough to pierce with a knife. Cool, peel and slice into 1/2 inch thick slices. Coat with cornstarch and salt and shallow fry in a pan until pale gold in colour. Remove and set aside. Blend to a thick puree the curds, water and besan and set aside. Heat a kadhai with ghee and add the cloves, jeera, and carom seeds and allow it to sputter. Add the hing, turmeric, ginger and red chilli powder. Add the curd puree, lower heat and cook for 6-8 minutes until it comes to a soft simmer, add a bit more water if you want the gravy to be thinner, add salt and the pan fried arbi. add a slit chilli and cook for another minute or two and then add lime juice and coriander leaves and turn off the flame. Serve hot with phulka rotis or any bread of your choice. Very rarely does one have the chance to interact with the owner of a restaurant and his family, and recently I had the opportunity to meet Akshay Luthria and his elegant mother Ms. Vandana and vivacious sister Ankita. It was so wonderful to meet Akshay, who cooks from the heart and his team of chefs who are trained in the kitchens of 5*star hotels deftly combine flavors from his childhood, his heritage, and the bountiful produce from Namma Bengaluru to create wonderful Sindhi and North West Frontier cuisine which are absolutely delectable. Sindhi cuisine is not very famous as there are very few restaurants pan India that serve it, but its here.... ready to rule the hearts of all and give the regular North Indian restaurants a run for their money! Since I am a vegetarian and this blog is about Vegetarian cuisine, the dishes I will focus on the Vegetarian menu, but they have an extensive non-vegetarian menu as well. We started off with a mint drink that were refreshing and cleansed our palate as we moved onto a mind boggling variety of appetizers, and the winners without a doubt were Dal tikri ~ chana dal served on crisp puris and topped with sweet and spicy chutneys and chopped onions. Palak Papri chaat ~ crisp deep fried palak leaves served with spiced yoghurt, then came Crispy Coriander Paneer, cubes of paneer stuffed with spinach, cheese, nuts and coated with coriander and deep fried ~ the dish just melted in the mouth as the paneer was so succulent and moist, this dish was a clear winner for me. Other equally awesome dishes were the famous Soya chap, a dish made with sheets of soya to mimic chicken, Stuffed Karela ~ large pieces of bitter gourd stuffed paneer and afghani style spices. The stuffed Mushrooms were filled with fenugreek cheese and cooked in the tandoor and had that wonderful smoky flavour too it. Served with the appetizers were onions soaking in curd and spices and a variety of Chutney's including one made with tomatoes and green chillies that is Akshay's mother special recipe/blend. Moving to the Mains, we tasted the traditional Sindhi Sai Bhaji and Bhugga/Wari chawal, then to Sindhi kadhi, steamed rice and Aloo Tuk. Next came an onslaught of gravy dishes like Paneer Peshawari, Dal Bhukara, Sabzi Lazeez ~ a melange of vegetables cooked in a saffron infused yoghurt sauce and another unique dish Sunheri Kofta Makhan palak ~ succulent koftas in a creamed palak gravy, truly delicious and these were served with Balochi Naan, Kadak Mirch ka parotha, soft Khameeri roti, and Kashmiri Naan which was studded with assorted dry fruits. I wish I could describe in detail about each dish.....but the bottom line is that everything was delicious and well worth a visit. It might just become a family favourite and your go to place in Malleshwaram. Finally, while I had no place left for dessert...I squeezed in Angoori rasmalai (the most softest melt in the mouth Ras Malai I've ever had) served on a bed of Gajar ka halwa and studded with a piece of Pragree, deep fried pastry stuffed with khoa and dunked in a sugar syrup (a seasonal Sindhi dish served for Holi festival). COE: I was invited for the preview by the restaurant and am posting voluntarily this unbiased recommendation of their amazing Menu. So to wrap up the post: My recommendation is pretty self evident, please do give it a try and I'm sure you will not regret it. Unique dishes prepared with seasonal produce, cooked without excessive use of cream, oil, ghee and cooking soda. The restaurant is located inside Bloom Boutique hotel and are open for Breakfast, Lunch, High Tea/Snack/Chaat and dinner. They also have a catering arm and can customize our party/needs and also do Boxed lunches for offices, etc.